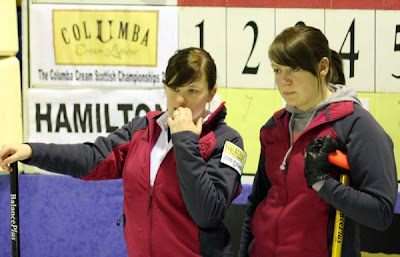 It was the battle between the two GB Olympic Squad teammates this morning in the Columba Cream Scottish Ladies Curling Championship at Perth. 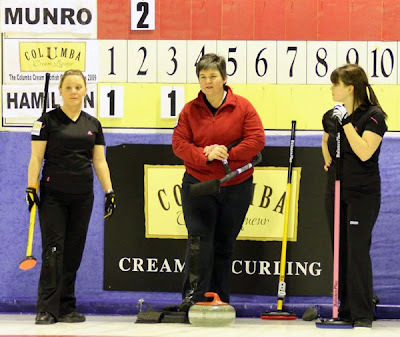 And it was Eve Muirhead and her team that came out on top against Kelly Woods' side. Two behind in the ninth, the Scottish Junior Champ made a raise takeout for a pair, and in the tenth, with the end set up well by her team, she placed her last two stones perfectly. Kelly was left with a delicate raise to the button. She was close, but not close enough, and the two teams share top spot in the rankings, which you can see here. Jackie Lockhart and Kelly Wood discuss options. Claire MacDonald (left) is substituting for Lauren Gray this week as third player in Claire Hamilton's side. They took a three from Gail Munro this morning in the seventh end and ran out 8-6 ahead. Hamilton and Munro are jointly third on the standings now, on seven wins apiece. Sharon Stewart, Gail Munro and Kerry Adams. Just a minor point for clarification please - did Kelly/Eve's game actually go to an extra end? No, it didn't, thanks for keeping me right. I've changed the text. Eve got the two in the ninth, and then stole in the tenth. It was the only game on the ice by that time. Note to self - must learn to read scoreboards! Apologies.